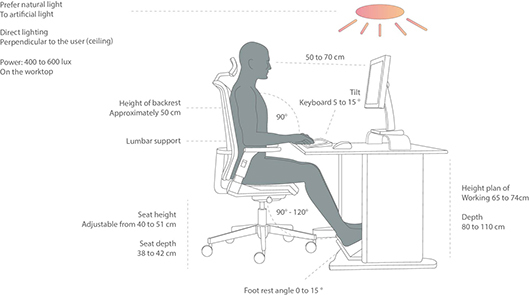 The design of ergonomic workstations saves both productivity for the company and comfort and safety for employees. The work plan :The feet rest flat on the floor or on a footrest. The angle of the elbow is straight or slightly obtuse. The forearms are close to the body. The hand is in the extension of the forearm. The head is straight or slightly leaning forward. The worktop should preferably be pastel and matte in color.